With my kitbashes of Russian Spetsnaz figures, I am always on the lookout for reference material. And any new ideas to make my boxed figures different, and I read about an idea by Scimitar Mcmlxv about a Black Korund VM armour vest. A very good webpage he found is here - Korund VM Vest which shows the Black vest. The original Green 1/6th vest shown here is one I bought loose from the DAM Vympel figure, and as an experiment I have used some Tarrago Black shoe cream to re-colour it. The picture on the right, shows my original experiment to see how the cream would cover the material, by rubbing it in with a tissue. I must say that the original idea to use this cream in this manner was not mine, as it was a method that I first saw used on the OneSixth UK forum by both Jbcat and Old Git. A link to the company that makes the shoe cream is here, and a colour chart for the cream is here. The pictures above show the original Green vest front and rear, with the next pictures showing the same vest after I used the Black shoe cream on it. Originally I used a tissue that was put into the cream and rubbed it in, on the reverse of the vest. So that if it did not work as I wanted, I would still have the original Green colour on the front. But by using the tissue to apply the cream, I found that it can cover the material, but it does not seem to go deep into it. So after re-reading the OneSixth UK forum post again, I looked at something else to use to apply it to the material. So I used a toothbrush to apply it. With the toothbrush I found that I could easily scrub the cream into the material, especially in the edges and onto the velcro material. It also helped to make sure that the cream got into the material behind the pocket flaps. I also had to take the vest apart on the velcro parts, to get the cream into all the edges and inside the pockets. I have not polished it or rubbed it with a clean cloth, as I want to keep the dull matt finish it has, so I just left it to dry. Which I found does not take long, in fact by the time I had finished re-colouring the front of the vest some parts were already dry. Which has helped to show up the pieces that needed to be touched up again. 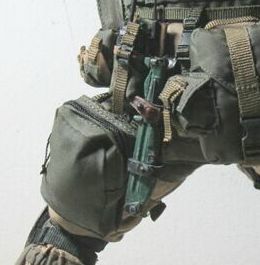 This is a leg pouch that I have wanted to make for my latest Spetsnaz kitbashes, since I have seen it used by dantte with his Vympel figure as shown right. 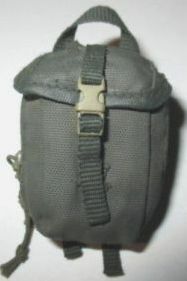 As a result I wanted to make a similar pouch for my Vympel figure. 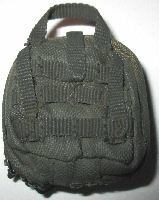 I have done some research into this pouch, and from what I have found it is a medical pouch, and I have found the following links. Medic Pouch, Medic Pouch, Medic Pouch. 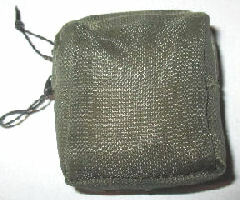 With this particular pouch I have done some research on them, and from this I have made the following four pouches for myself. 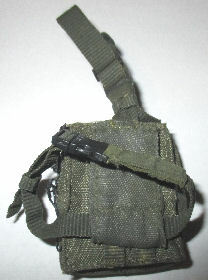 And based on the discussion with dantte about this pouch it was mentioned it was made from a base of a Toys City US Navy Corpsman pouch. With this pouch as that was the nearest that I could find that looked like my reference pictures. 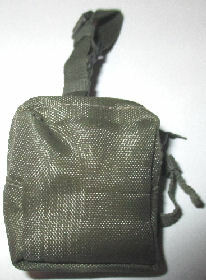 As well as the same pouch that dantte used with his figure. I have had to cut the top flap cut off to leave the main pouch as shown below in Picture 1. And as shown in Picture 2. 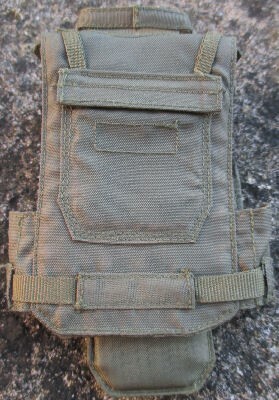 I have used a separate Molle leg holder that I bought separately, which I have sewn onto the back of the Corpsman pouch. 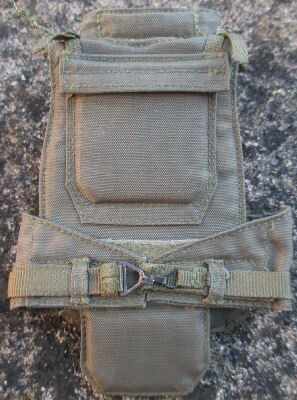 It also came with the strap to go around the leg, as well as the additional strap for the waist belt on the top of the pouch. Once I had finished the pouch and straps, I then mixed up some acrylic paint to try to match the original pouch colour, So that the whole unit was of a similar colour. 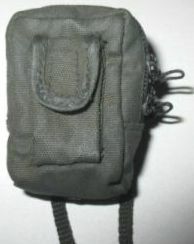 In Picture 3. this is made from another Toys City US Navy Corpsman pouch as above, but for this pouch I have sewn the straps directly to it. Firstly I sewed two Brown straps onto the back of the pouch, leaving a gap at the bottom so that I could then pass the leg strap through it. 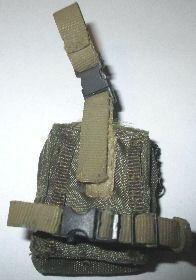 The additional strap to hang the pouch from the waist belt, was also sewn directly onto the back as shown in Picture 4. These straps were painted with acrylic paint in a Tan colour. This is my third attempt in Pictures 5. 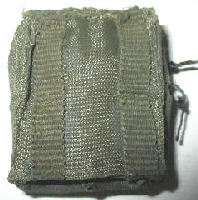 & 6. at a modern Russian medic pouch for my figures, and on this occasion I have just added two thicker straps sewn directly onto the back of the pouch. I have left two gaps in the strap, so that I can thread a belt though the gaps so it can be worn on the figure's waist along with other pouches. 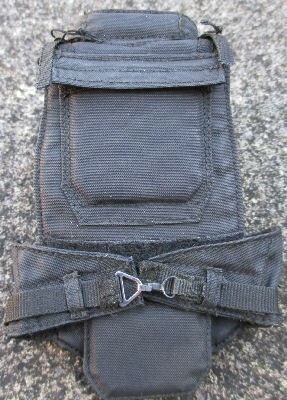 The purpose of the two gaps, is that I can adjust the height of the pouch on the belt. Again, the acrylic paint was mixed to almost match the original pouch colour. In Pictures 7. 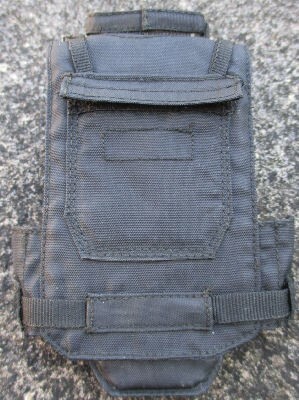 & 8. is my fourth medic pouch based on my reference material, this is one that I have bought loose. 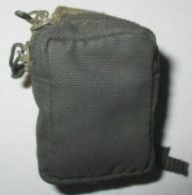 But for this pouch I have sewn a central buckle strap to hold it together, I have also sewn a webbing handle at the top. Once I had finished it I then re-painted it with an Olive Green acrylic paint, because the webbing straps I added were of a different colour. 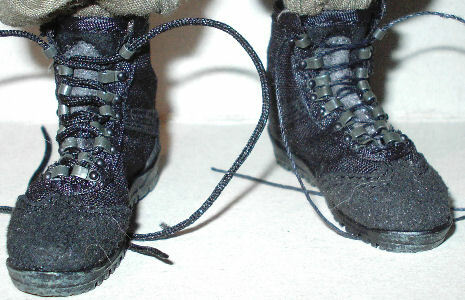 With my DAM Vympel figure I am working on, I am going to take out the supplied laces, as I felt that they looked out of scale with the boots and I am going to replace them with a strong black thick thread I have. Which is about half the thickness of the original laces, and to me they are now more in scale. I did this because the more I looked at the original laces the more they looked overscale to me. Especially when I tried to tie the laces as the knot looked massive. So in Picture 9. I have on the left boot the original DAM lace, but on the right boot I have changed the lace to the thinner and longer thread. Which now gives me more thread to wrap around the boot top, before I tie a knot. Note: I have found that the DAM boots are very well made, with the eyelets for the laces securely fixed into the boot material. But care will have to be taken when I tie the laces, as I do not want to pull the eyelets out by pulling on the thread too hard. 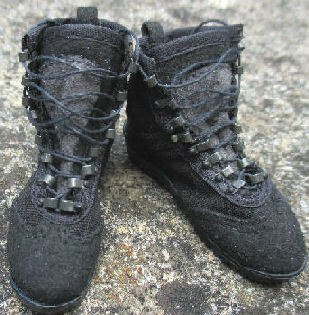 In Picture 10. my pair of DAM Vympel boots have been re-laced. Please Note: That I had one of the eyelets break on me, the sharp eyed among you will see it. So I had to make a new pin for the eyelet from some stretched sprue, so that I could refit the eyelet to the boot. As a result I have also had to crimp the other eyelet pins in place, with some gentle pressure from a pair of long nosed pliers on top of the pin. I was looking at my DAM Vityaz figure, and in particular the large belt pouches as shown on the right that the figure comes with. 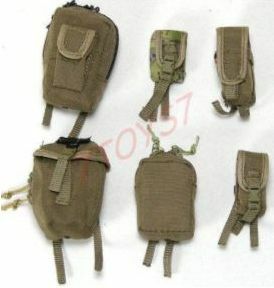 And I realised that two pairs of pouches that I bought loose, that came from the DAM USMC 26th assault force figure. 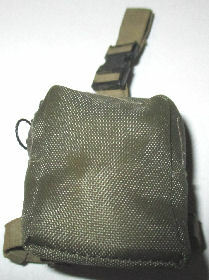 Has a pair of large pouches that are very similar in both size and the fastenings, to the Vityaz pouches. So I got to wondering if they could be used with my figures. 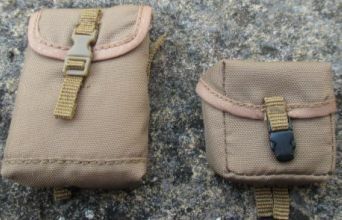 Picture 11. is of the original pouches with the different buckle colours, with Picture 12. showing the re-painted large and small pouches. The paint I used for the main body of the pouches was Tamiya acrylic XF-13 J.A Green. Which is the nearest match that I can find to match with my other pouches, without having to mix different paint shades to get what I want. 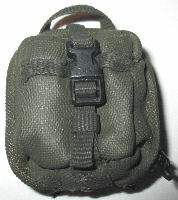 The straps and lid edges were re-painted with Tamiya acrylic XF-74 Olive Drab (JDSDF) which is a darker green. The large pouch buckle was first re-coloured with a Black permanent marker pen, which acted like a primer for the Black acrylic paint. To weather the pouches, I used a light drybrush of Tamiya Green weathering powder as well as Tamiya Light Sand. Picture 13. shows the Soldier Story 1/6 US Air Force TACP pouches I bought, that have some that are similar to the pouch pictures linked to above. 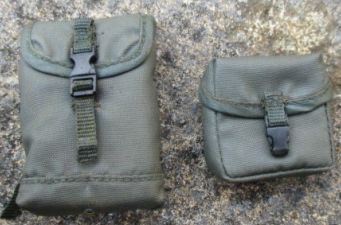 Picture 14. shows the pouches after I have altered and repainted them the same way I did in Picture 12. Many thanks to Jbcat and Old Git for the original shoe cream idea I have used here. Many thanks to Scimitar Mcmlxv for his idea about changing the colour of this vest. Many thanks to dantte for the information about the leg pouch.